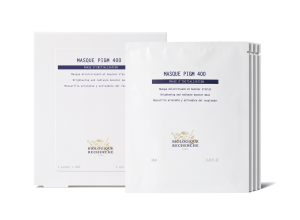 The Masque PIGM400 is our latest sheet mask launch and addition to the PIGM400 range. Highly concentrated in exceptional brightening and antioxidants active ingredients, this pre-soaked mask targets pigment production and evens the complexion. Made of Lyocell fibers, a natural, eco-friendly material that is fully biodegradable, the mask perfectly adapts to the contours of the face, thus enabling optimum diffusion of the agents. The results are clearly visible in both the short and long term; Marks of fatigue are instantly smoothed away and erased, as the skin’s radiance is restored from the very first application. Dark spots become faded and are prevented when the Masque PIGM400 is used on a regular basis. These radiance-boosting masks come in a pack of 4 to address the needs of pigmented and devitalised skins. Anti-melanogenesis agents: Dulse Extract (Seaweed), Complex of Pea Extract and Sucrose Dilaurate and Stabilised Vitamin C.
Radiance-boosting agents: Caviar Lime Extract. Anti-dark spot agents: A-Glucan Detox.